for solutions or alternatives to help our clients with 3 different aspects: Safety - Efficiency - Performance. 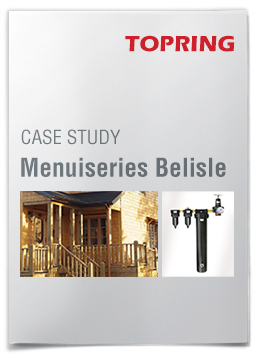 In the case of Menuiseries Belisle, our advice and changes were mainly focused on the performance aspect. To complete this case study, we met with Jean-Pierre Belisle, director of production and co-owner, Menuiseries Belisle. The advantage of a closed-loop network is that the air produced by the compressor can travel through several lines at a time, providing balanced pressure and airflow throughout the entire network. The drops are powered by two air sources. This enables to install tubes of smaller diameter thus reducing the initial cost of the system and improving operating efficiency. When compared to a steel piping or assembled flexible hoses, an aluminium air piping system offers many performance advantages. Aluminium pipes resist to corrosion and do not deteriorate. They allow air to circulate freely without friction.